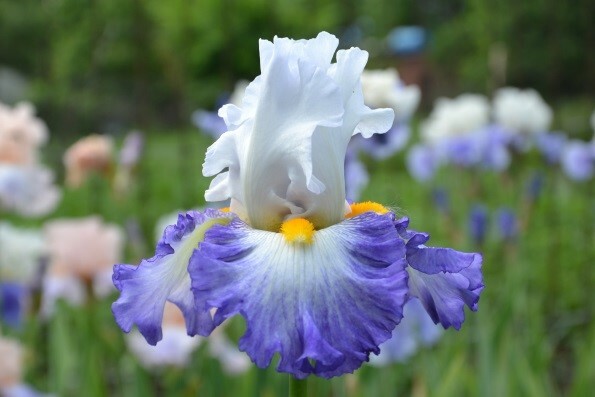 I am glad to welcome all fans of irises! My name is Sergey Stroganov, and I live in the South of Russia (USDA zone 6B). 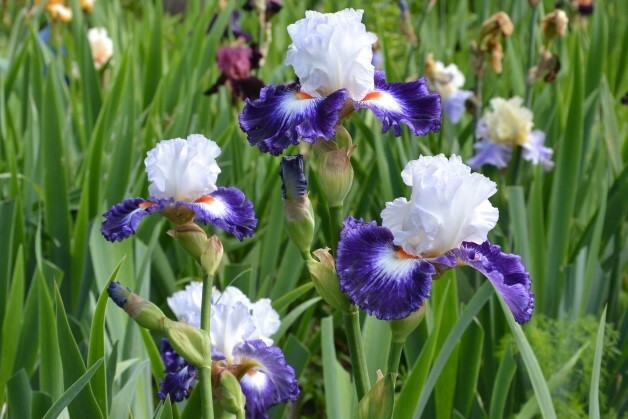 In our country, there are a lot of fans of beautiful flowers, and many of these gardens grow bearded irises. The most popular iris in those gardens is tall bearded, which are grown from 3 to 8 zones. 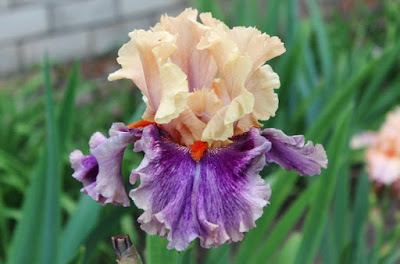 Here and in my garden I grow mostly tall bearded irises. 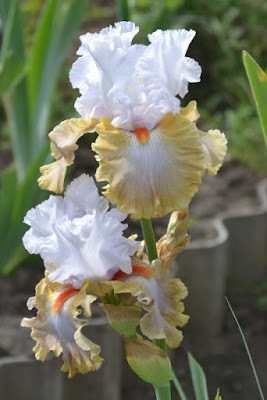 I am very grateful for the kind offer to blog, and my first photo post I want to devote to all known variety of iris 'Gypsy Lord' and varieties obtained with his participation, which are more than 90 (in our I garden grow some of them). 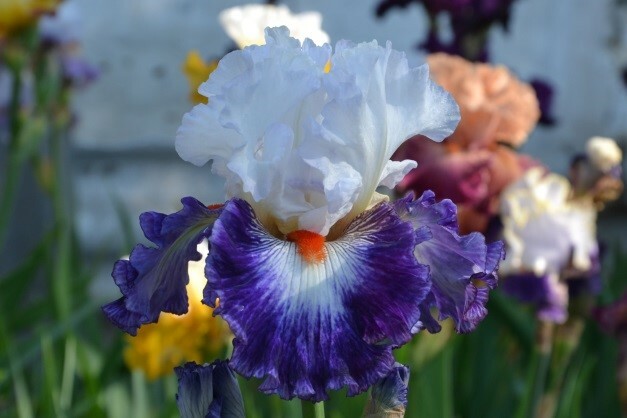 So- 'Gypsy Lord' (Keith Keppel, 2005) - a posh iris, winner of honorary reviews and medals - Honorable Mention 2008; Franklin Cook Cup 2008; Award of Merit 2010; Wister Medal 2015, American Dykes Medal 2015! Conspicuous long bright beard, contrasting falls, good shape and branching and great growth. In the spring, before budding, thanks to its advanced growth of green mass it is pleasing to the eye. Now presenting irises with Gypsy Lord as a parent. Iris 'Girls Got Rhythm', Barry Blyth, 2013 with a long parent list (Parentage: Gypsy Lord X Keppel 05-114A: (01-99A: (96-28B, Mysterious Ways sib, x 98-122A: (Shoop 91-26: (Summer Fashion x Coming up Roses) x Lotus Land)) x Decadence)). As you can see, Gypsy Lord was good as a parent plant and as a parent. 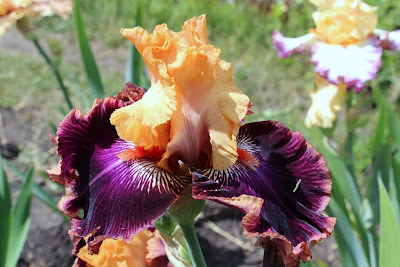 Next, I would like to Supplement my post with some wonderful photos of other Russian collectors in order to further expand the picture of the ideas about irises that came from the Gypsy Lord. And, finally, one of the varieties of the Russian hybridizer – 'Kozyrny Tuz' Olga Riabykh, 2011. Bright, memorable, good and abundant growth. Photo by Nadezhda Zotova in her garden. All other images by the author. 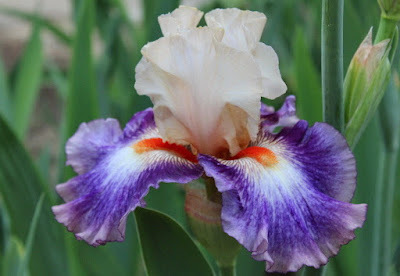 Today marks the day that we publish our first post for the American Iris Society blog. We would like to thank the editors for offering us this opportunity to be part of the blogging team all the way from Down Under! We are Melissa and Bailey Schiller, mother and son owners of Smokin Heights Nursery. We specialise in bearded iris, with a further interest in hybridizing novelties. 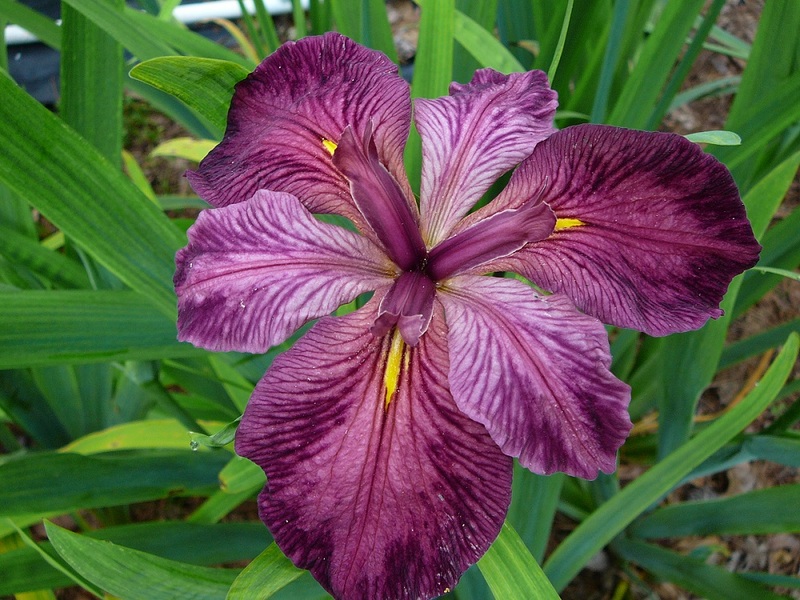 Melissa started collecting iris about 25 years ago after acquiring 5 iris from her grandmother. The iris virus soon took a hold and it became an obsession for Melissa. She soon discovered Tempo Two Nursery and started to increase her collection. Every Spring she would open the garden to the public and offer excess varieties for sale. Barry, Lesley and Heidi Blyth soon became mentors to what Melissa wanted to grow and use in her own garden and to achieve in her hybridizing goals. Bailey at the age of 13 watched on while Melissa dabbled in the iris field with replant and hybridizing, and just like that Bailey took the tweezers from Melissa’s hand and started doing his own crosses. The Spring of 2013 Barry invited us to Tempo Two. This was a quick day trip with a bored dad and husband in tow. We remember being so overwhelmed with the view in front of us. 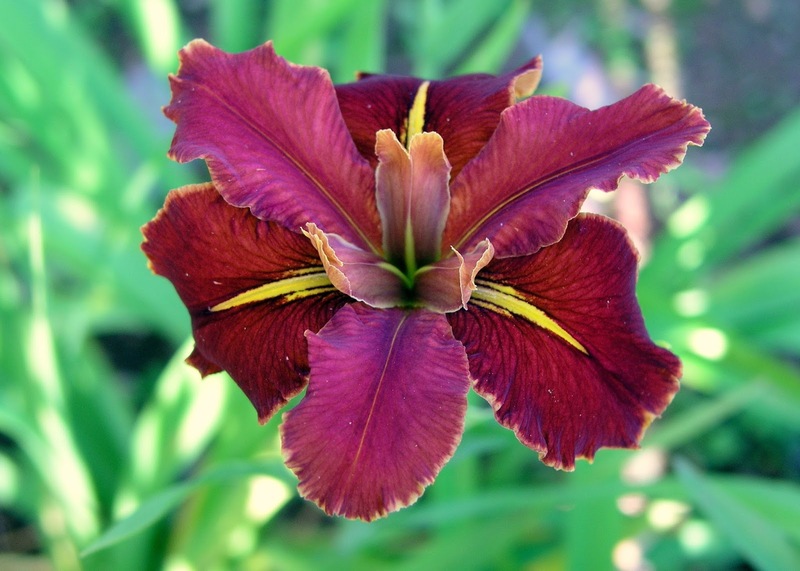 Being allowed into Barry’s seedling field was a soul fulfilling experience…..frantically we rushed around doing so many crosses with the little time we had. On this our first trip Barry spent only a little time with us as the Barn was open with people everywhere. Barry, Lesley and Heidi were flat out. We even met Tim Blyth this day too near the end of our visit. This is where Bailey and his photographic memory was first recognized. A very useful tool but can get annoying when he gets going. 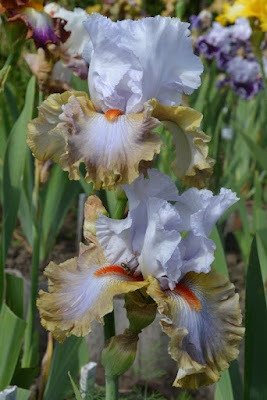 Bailey has the ability to read the pedigree of iris and remember it, as well as where it is positioned in the garden. 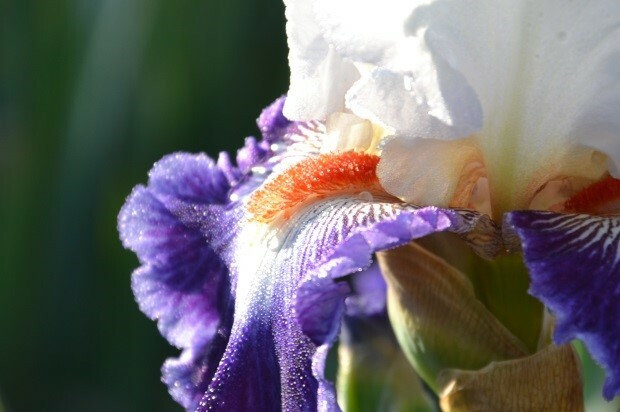 A very useful tool for everyone who spends time with him in the iris field! This visit we met with Roland Dejoux and also Kirk Hansen. In the spring of 2014 we were invited again to Tempo Two. 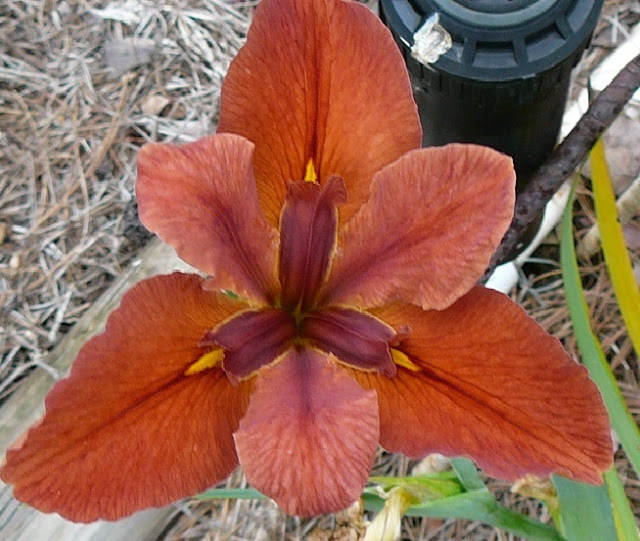 We spent several extremely busy days hybridizing and spending special time with Barry, Lesley and Heidi Blyth. We were also privileged to meet and begin our friendship with Thomas Johnson and Kirk Hansen. WOW. 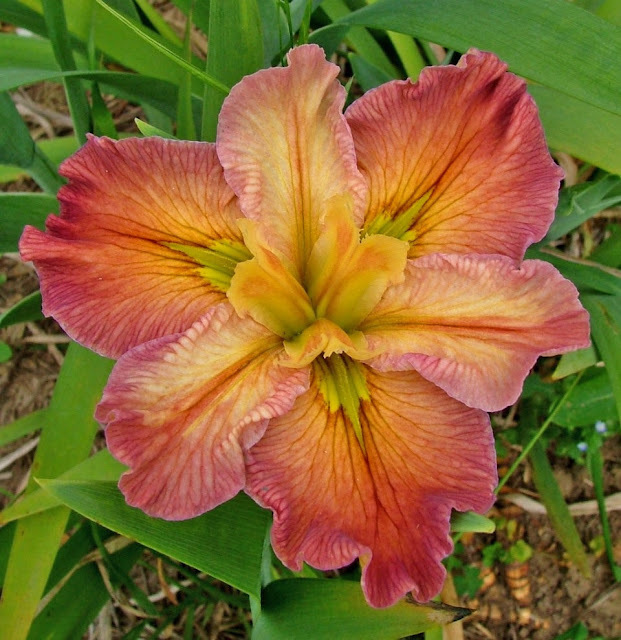 This particular year Barry spent a lot of time with Bailey discussing the iris with a focal point on genetics. Over the next few months any questions that Bailey had he would email Barry. Barry and Bailey discussed everything iris related. Seedling pictures were exchanged and more discussion ensued. Bailey would offer ideas to Barry and vice versa. I think Barry got the idea pretty quickly that Bailey’s style of hybridizing was much like his own. Have a go with this to that and who knows what you will get! This rule of thumb applies to the Blyth genetics where Barry’s lines are criss crossed and then crossed together. Does that make sense? The mentoring continues to this day but now has branched out to include Thomas Johnson, Paul Black, and Keith Keppel. We love the frivolity and guidance we receive from these gentlemen in the iris field. We would like to finish off the blog with a couple seedlings and just a brief overview of our hybridising goals which will be continued in our next installment. Bailey is a lover of all things weird and whacky, and this shows in his hybridising. With a particular focus and interest in breeding novelties. F74-1 (pictured above) was his favourite seedling to have its maiden bloom in Spring 2018. Coming from two 6-falled (flat) parents is this consistently flat iris. 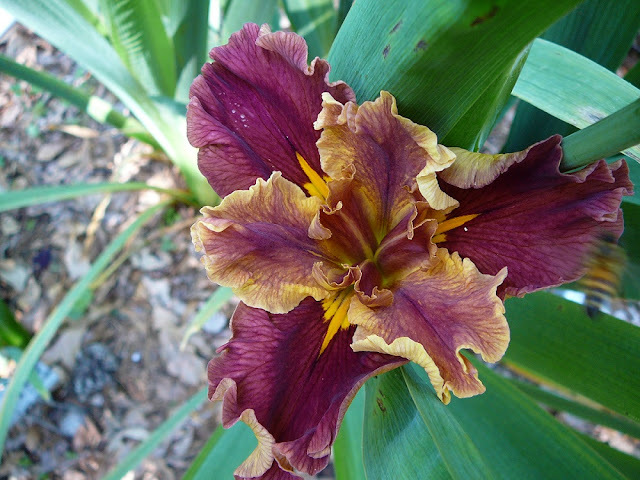 Bailey has been working on flat iris for a few years now and this is the best to bloom thus far. If you look closely at the photo of F50-4 you will notice some white colour breaks on the falls. Very interesting to see the plicata pattern and broken colour pattern in the same bloom, neither one dominating the other. We definitely plan on exploring this further! 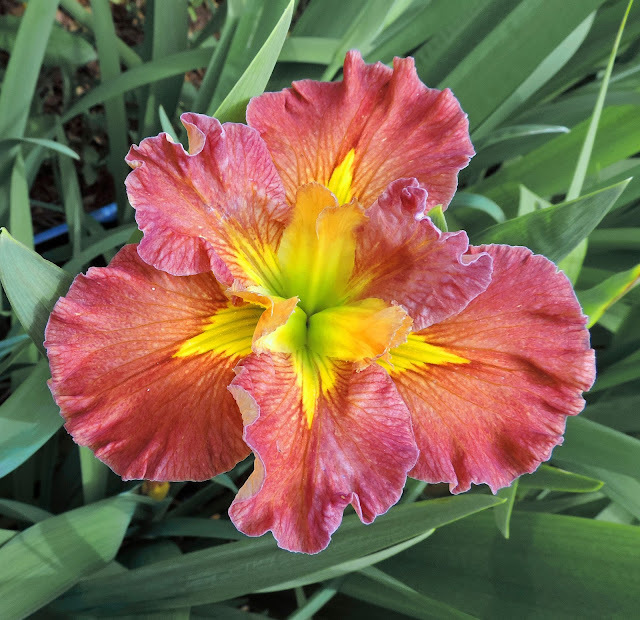 In our next blog we will delve deeper into our hybridizing and show everyone what we have been working on and where we would like to go with our breeding lines. 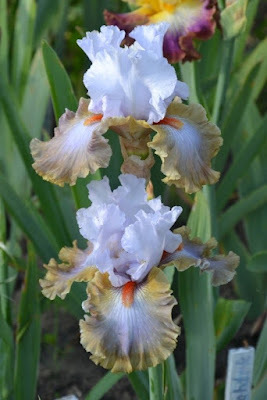 Editors' Note: Barry Blyth, along with Graeme Grosvenor and John Taylor, are the best known to the rest of the world of the Australian iris hybridizers. For many years, Mr. Blyth operated Tempo Two, but two years ago, he retired. His introductions are now listed at Mid America Gardens in Salem, Oregon. Thomas Johnson and Kirk Hansen run the business. Please note that we leave UK spelling of English words alone. 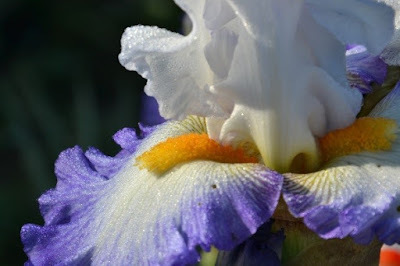 I grew up in Massachusetts in the AIS of the 60’s and when we went on tours the iris were not grown like a corn field but rather as a part of a garden picture. 'Cup Race' was one of the famous irises to come out of the Stedman Buttrick garden. 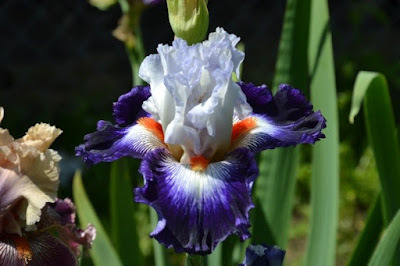 Image courtesy of Schreiner's Iris Gardens. Some of these gardens were impressive beyond words. 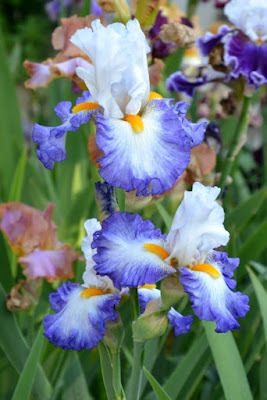 Leola Fraim’s, Miriam Corey’s and Stedman Buttrick’s gardens were amazing collections of irises but housed with an equally impressive array of other perennials. Almost every garden had three perennials that bloomed essentially along with the irises. Peonies, in shades of rose and pink, were used to complement the abundant blues of the irises, and were especially effective against clumps of blue Siberian irises. The peonies were large enough that they could almost be used as shrubs in these borders. Oriental poppies were very much the rage in that era. The Fischer Oriental poppies brought to the public a range of colors and forms that had not been seen previously. 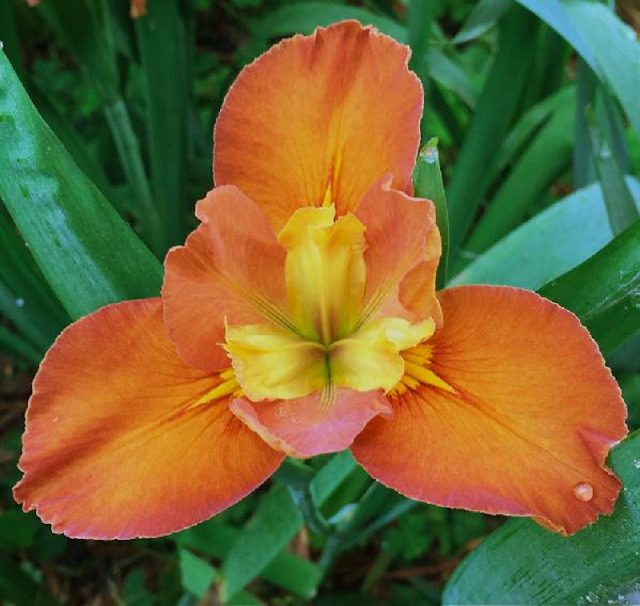 Clean pinks, whites, and raspberry shades were now in the palette of colors available to the gardener in addition to the more vibrant (and less easy to use in landscaping) oranges and reds. When the Countess von Stein Zeppelin visited from Germany, she was so impressed that she negotiated with Mr. Fischer for seeds and plants of hers so that she could develop her own strain for European gardeners. In Massachusetts, lupines were almost weeds (in fact they have naturalized in places in Maine) and the Russell strain offered clear colors and much better density of the flowers on the heads than in previous strains. One plant that was popular in Massachusetts at that time was the gas plant (Dictamnus). 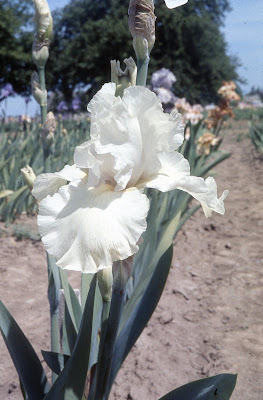 Mrs. Corey had actually crossed the dark rose and white strains and had several unusual shades of white veined pink and clear pink. These are very solid plants. One of the fond memories of my youth in Massachusetts was blooming a seedling from Mrs. Corey’s strain and also lighting the gas with a match. Odd that you don’t see them more used today. 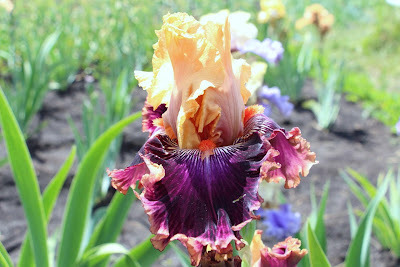 Besides what we were observing at iris peak almost every one of these gardens featured daffodils and other spring bulbs, daylilies and towards the shadier portions, hosta. 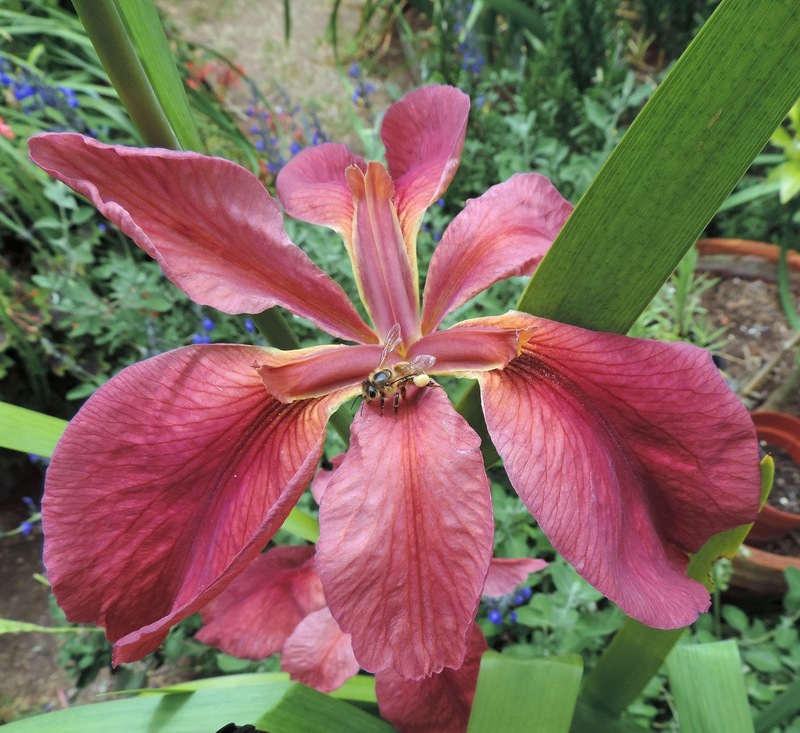 In many cases, these “other companion plants” became interests of their owners too and almost everyone dabbed a little pollen from one of these groups as well as the iris. 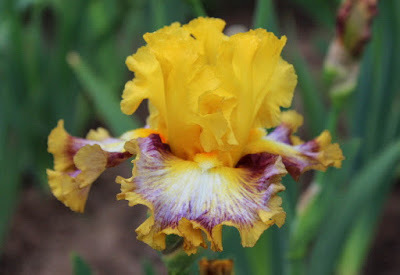 Consequently, the collections of these plants were also state of the art. 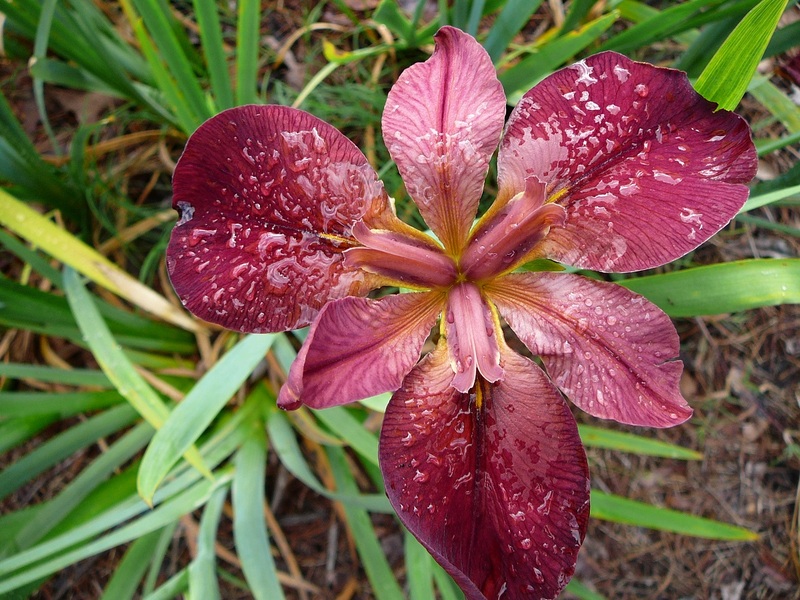 A visit to these gardens even before or after iris peak was still a treat. All of these yards had another component that most of us don’t think of as part of the garden: beautiful pristine lawns that bordered every bed. Lawns are like the frame on the picture. 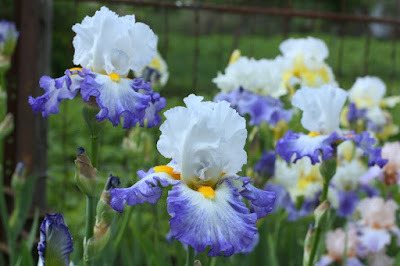 They offer a refreshing green that cools the effect of the garden and sets off all the plantings. In the Buttrick garden, these lawns flowed gently down to the banks of the scenic Concord River. Polly Bishop, who was my mentor, had a lovely perennial garden, although not on the scale of the bigger gardens in Region 1. 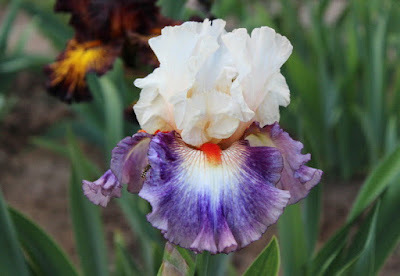 She had crossed pansies with Johnny jump-ups to create a strain of hardy hybrids that self-sowed and blanketed the irises and bloomed throughout the year. 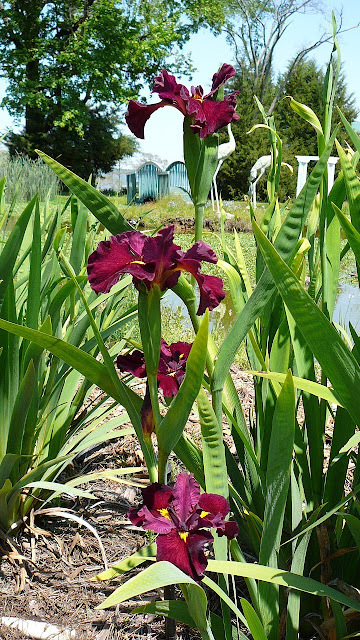 These were shallow-rooted plants and provided a living mulch around the bearded irises in the winter. In Polly’s garden, hardy succulents such a sedums and hens-and-chickens, were used to highlight the beds as well as many other rock garden type plants. 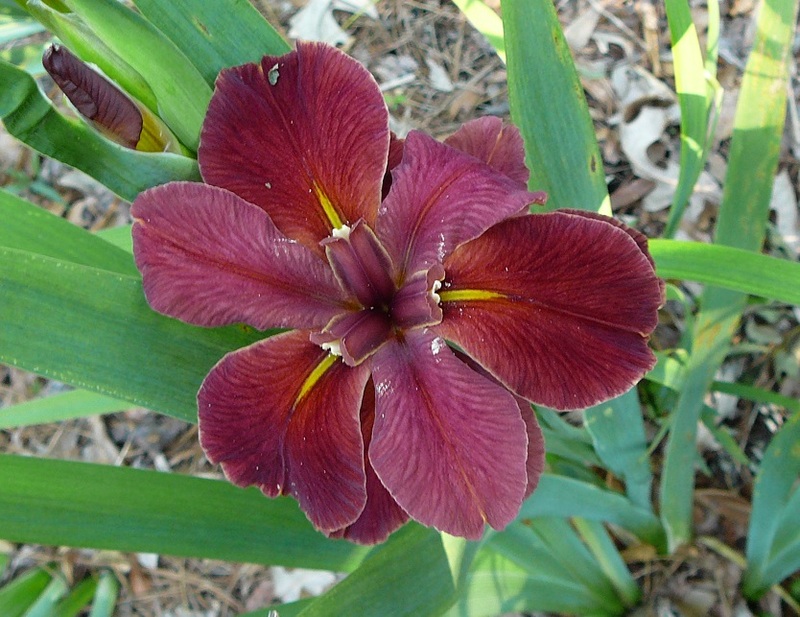 These plants liked the same sharp-drained soil conditions as the bearded irises and added interest in both foliage and in flower. 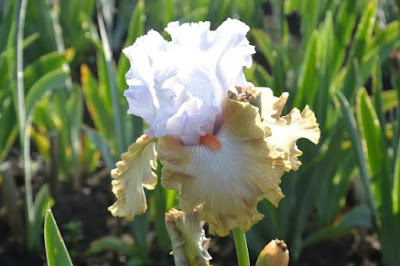 Admittedly, that it is MUCH easier to manage irises in rows in terms of cultivation. You can’t run a rototiller through a perennial border! 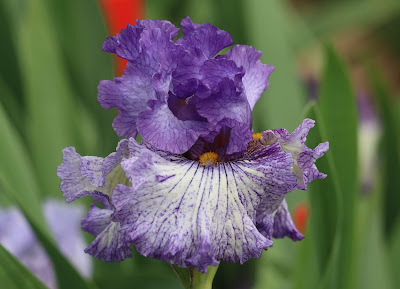 One only has to look at the magnificent display gardens at Schreiner’s here in Salem Oregon to see how effective irises can be as part of a much bigger picture. I’m talking to myself somewhat here too. 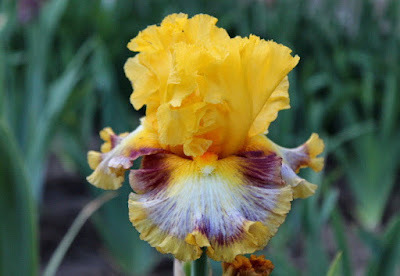 Although I don’t do corn rows, I do use raised beds chiefly of bearded irises. The spurias and Siberians are much more integrated into the borders and the Pacific Coast Natives are incorporated into the shade borders. Now to work on those bearded beds Kevin!